Turkey Tracks is a quaint attraction along Illinois Route 66 where you can actually see turkey tracks in the pavement in Nilwood. 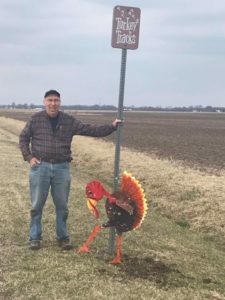 Ron Wichern, a local farmer has graciously hand made a new Turkey Tracks sign denoting the location of the tracks. Our Motor Tour will stop by the Turkey Tracks on June 9 between 1:00 PM and 3:00 PM.